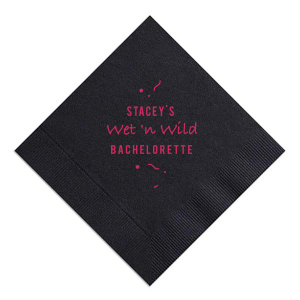 Bring the best of the ‘90s to a birthday party, sorority social or even a bar/bat mitzvah. Trendy and always fun, it certainly doesn’t need to be Thursday to throw it back with this party theme! 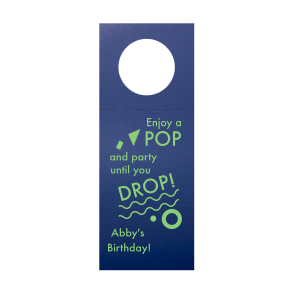 Complete your ‘90s party look with rad personalized party supplies designed on theme. 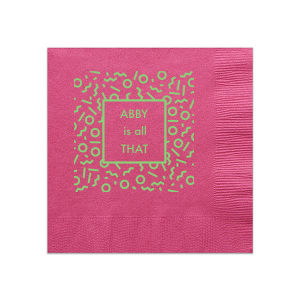 You can create custom napkins with neon colors and confetti swirl designs reminiscent of the decade that was all that. 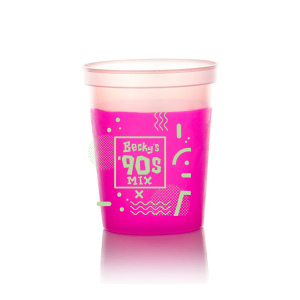 Keep the party popping in every detail with ‘90s themed plastic party cups and party favors too! Time to pump it up! Throw a hoppin’ ‘90s theme party you and your friends aren’t soon to forget. By incorporating just a few ‘90s party ideas into your festivities, you’ll throw the party of the year. Create the atmosphere with ‘90s theme party decor featuring bright colors and bold patterns. Welcome guests through an arch of balloons and streamers into a fashion flashback. You can find classic pieces like rubix cubes and old cassette tapes to set on tables for ‘90s decor. Complete the ‘90s vibe with a playlist of ‘90s smash hits that’s deserving of a mixed tape. For food, serve ‘90s snacks galore. Lunchables, hot pockets, pizza rolls and cheese balls are finger foods sure to satisfy. 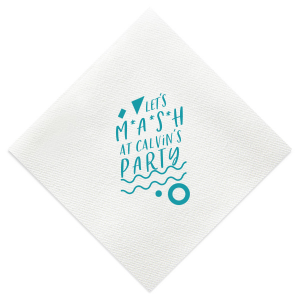 Style personalized cocktail napkins or luncheon napkins with your ‘90s designs to complement your theme and your food! Speaking of cocktails—your ‘90s drink station simply won’t be complete without a refreshing orange soda or a squeezit juice! Cream sodas and other flavored sodas are a safe bet too. A totally fly party food table will, of course, need an overload of sugar as well. For your ‘90s theme party desserts, we recommend cosmic brownies, ring pops, pop rocks and fruit roll-ups—to name a few! Think Saved by the Bell when sharing the ‘90s theme party dress code. Bring back the heyday of baggy, high-waisted jeans, doc martens, keds, overalls, crop tops, denim and leather mini skirts. Don’t forget the double buns, big bangs and high ponytails! With everyone dressed like a ‘90s kid, you’ll for sure want to include the current photobooth trend in this flashback party. Style your background with neon splatter paint and loud props like jumbo glasses and even silly string! Maybe a little green slime too...Complete the activity with polaroids to take the pictures. Other great ‘90s theme party activities are M.A.S.H. cards, paper to fold fortune tellers, an 8 ball or two, a big twister board and even a color station with a couple of felt Lisa Frank posters. Talk about a blast from the past! 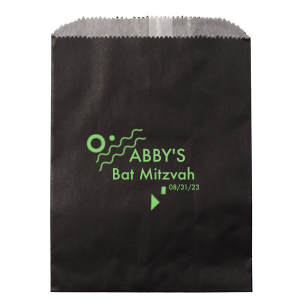 Send guests home with party favor bag stocked full with ‘90s memorabilia. 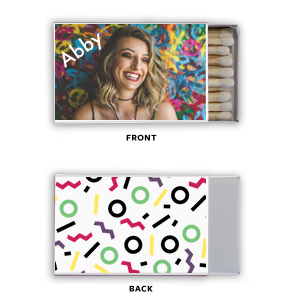 Guests can add their photo booth polaroids and paper fortune tellers to their personalized party favor bags that also includes pop rocks, wax coke bottle candies, glow sticks and other ‘90s themed goodies.